View More In Cuffs & Wraps. This absolutely stunning Cubic Zirconia Cuff Earrings in Sterling Silver is perfect to add that finishing touch when you want a bit of glamour to your look. Turn heads as you saunter down the street while the sterling silver exudes a dazzling shine. Featuring sparkling, CZ stones that will shimmer endlessly in the moonlight. SAFE FOR ALL SKIN TYPES: All NYC Sterling earrings are hypoallergenic and nickel free so they are safe for all skin types. If you have sensitive skin, you will love our product. 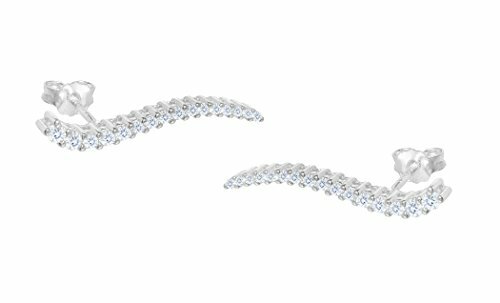 This Sterling Silver Crescent White Cubic Zirconia Ear Climber Crawler Earrings can be worn with any outfit or any occasion. COMFORT FIT: This Cubic Zirconia Ear Climber Crawler Earrings is a comfort fit design earring which would make it very comfortable on any women ear, if for some reason you are not comfortable with the fit please let us know. 100% SATISFACTION GUARANTEE! - Our absolute 100% no-questions-asked, you'll-totally-love-it-or-you-get-all-your-money-back guarantee. We think you will love Sterling Silver Crescent White Cubic Zirconia Ear Climber Crawler Earrings; however, we want you to be happy with your purchase! If there is a problem with your product we would love the chance to make it right. If you have simply changed your mind, please return it for a full refund. It's that simple. PACKAGING: NYC Sterling includes a blue or black velvet pouch, perfect for sending it as a gift or for a loved one.